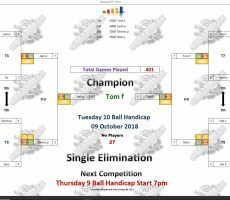 TUESDAY 10 BALL – 9th OCTOBER : TOM WINS. 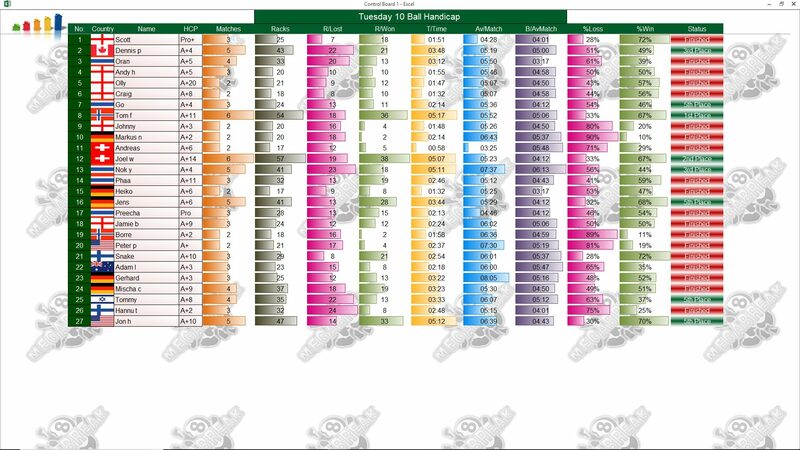 Norway’s Tom Fossum was back in the winners enclosure on Tuesday night to become our 10 Ball Champion for this week. 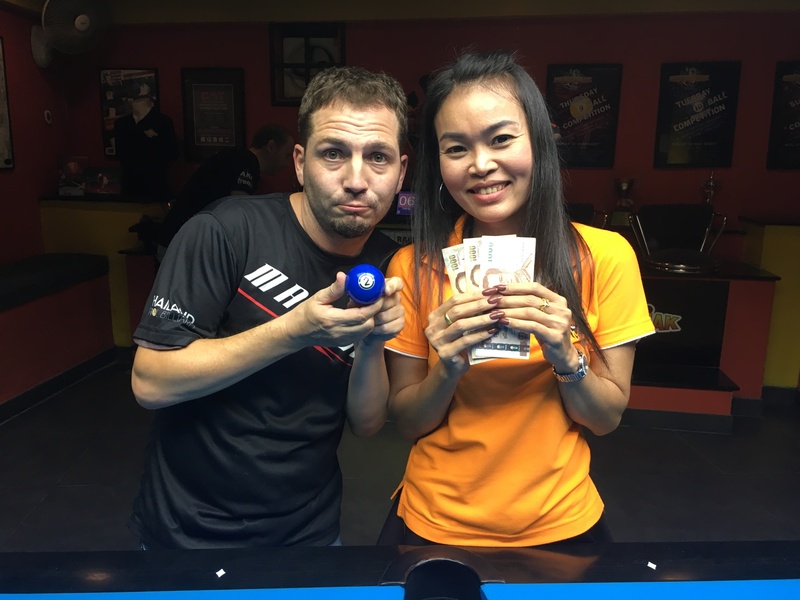 From another excellent entry of 27 players, he defeated Sunday’s 9 Ball winner, Joel Wenger from Switzerland in the final by 6 racks to 4 (race 6-7), to claim the 1st Prize of 5500 baht. He did lose his very first match of the evening in the groups, but then found his form to win five matches on the spin and lift the trophy. 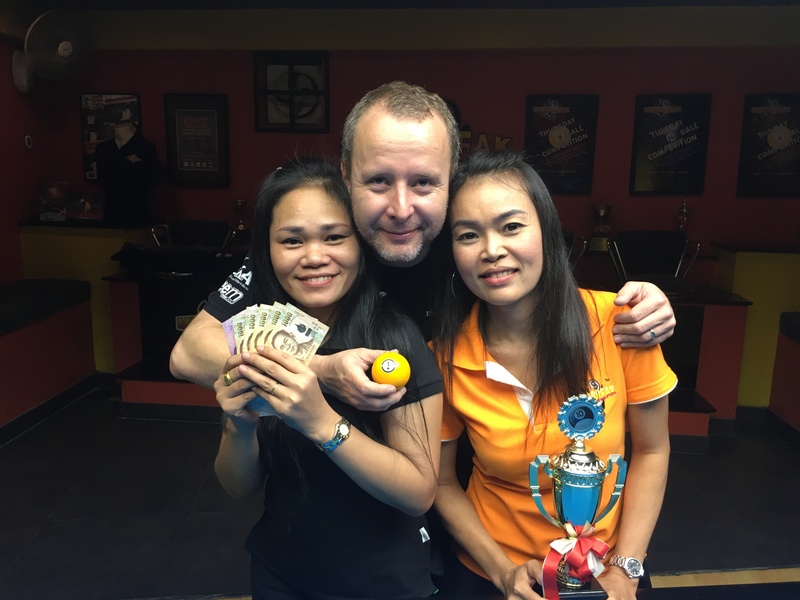 Joel continued his recent run of good form to reach his second consecutive final before running out of steam against Tom, and took home 3000 baht as Runner-Up. 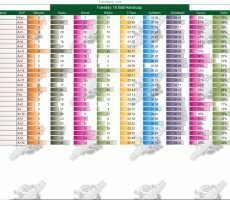 His handicap now moves back up to A+15 as a result. 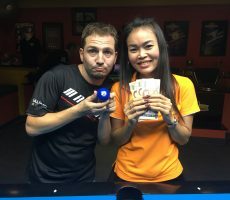 Dennis Presiloski from Canada and local Thai player Nok Yung were the other money winners on the night, each pocketing 1500 baht as losing semi-finalists. 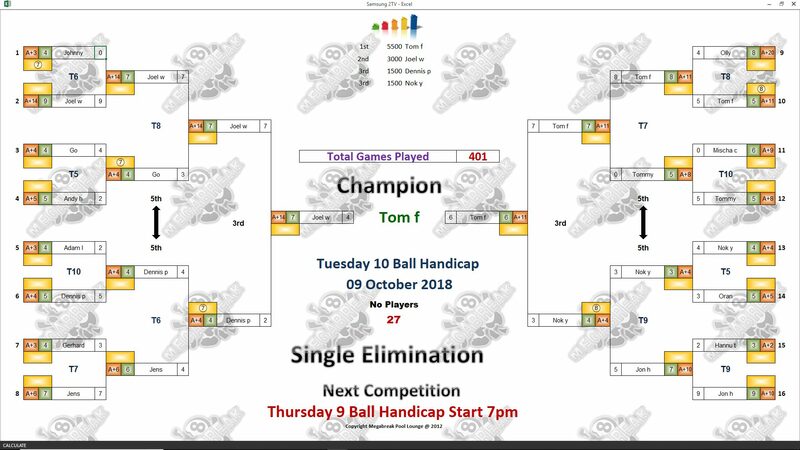 Champion : Tom (A+11) – 5500 baht. Runner-Up : Joel (A+14) – 3000 baht. 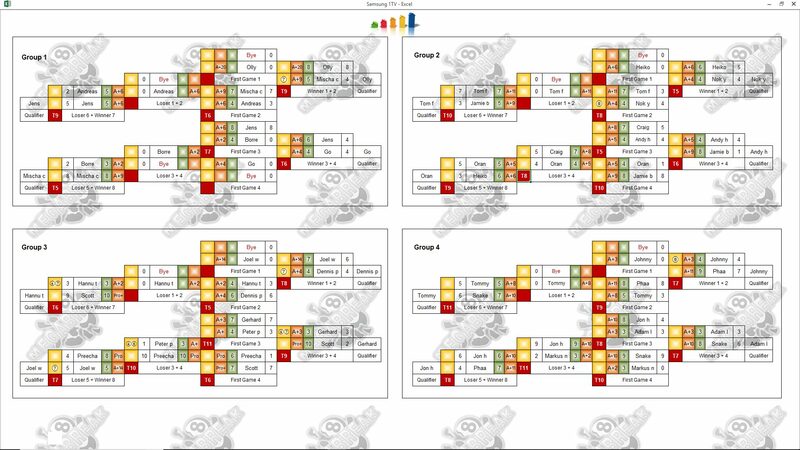 Semi-finals : Dennis (A+4) and Nok (A+4) – 1500 baht each. The Player Auction created an extra Prize Pot of 32500 baht, and was won by Olly Downey. He paid 1100 baht to get Tom, and they shared the 1st Payout of 9500. 1st (30%) : Olly (Tom) – 9500 baht. 2nd (22%) : Jamie Brooks (Joel) – 7000 baht. Equal 3rd (12%) : Me (Dennis) and Andy Hall (Nok) – 4000 baht each. 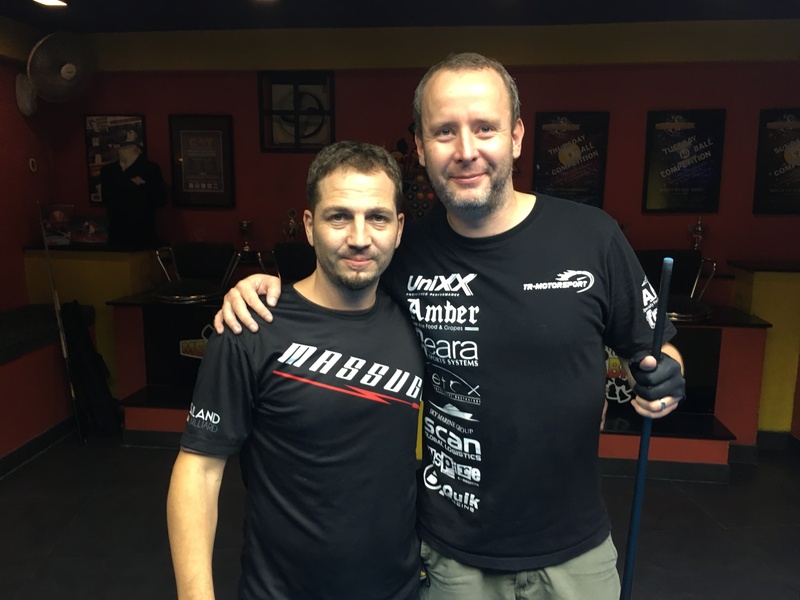 Equal 5th (6%) : Heiko Kadel (Jon US), Tommy (Himself), Craig Jones (Jens Ketzer), and Gerhard (Go) – 2000 baht each.